Anaerobic digestion plant smell is a very highly debated subject, and whenever most new AD (biogas) plants are proposed (and a planning application is submitted) it is a topic of great concern to every local resident. With that in mind, I expected to see any number of articles on this topic when I looked on the web. So, I looked, and I didn't find them. To my surprise I found that there are numerous website pages written by AD Plant objectors about specific planning applications, and by journalists reporting on what those same AD plant objectors were saying for local papers. But, nowhere did I see an attempt at presenting a rational view on this vexing question. It is an important subject, so I thought that I would write this piece in an attempt to present a "balanced" view on whether anaerobic digestion plants really do smell. First of all. Let's be perfectly honest, these plants handle organic materials and at times these will already be starting to decompose as soon as they reach the AD Plant site. Once on-site the anaerobic digestion process itself is inherently smelly. Nobody could truly say that there is not a potential odour problem for all biogas plants. 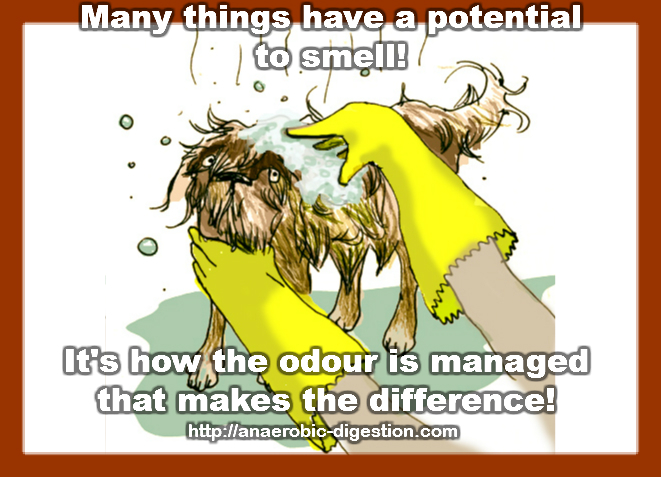 Decomposition (rotting) of organic matter produces some of the most offensive odours known to man, and decomposition is what the anaerobic digestion process is all about. So, anaerobic digestion smells? Well to put a finer point to it, the materials which are fed into a biogas reactor can smell unpleasantly, and the output which is known as "digestate" (simply meaning the liquid and fibre which is left-over after the biogas gas-making reaction has occurred) invariably has a nasty odour, when it is first exposed to the air. But, that categorically does not mean that an anaerobic digestion PLANT will smell, nor that anaerobic digestion plants are smelly. They can and should be operated responsibly, and with adequate design provisions for covered and air-sealed spaces, where the odour producing activities will take place. The great majority produce less odour than an average Dairy or intensive Chicken rearing farm. As in all walks of life, some people do fail to run their biogas facilities in a responsible manner, and there are regulations against causing odour nuisance which will always need to be policed alongside other environmental protection legislation. Commercial scale Anaerobic Digestion Plants in the UK, and in most other jurisdictions too, are subject to permitting requirements, and if these are not met, bodies like the UK Environment Agency have powers to close down the AD facility if an odour-nuisance persists. Odour that is produced by the AD process, can and must be contained and the ventilated air is filtered to remove any odour, before it is blown out through the ventilation system. The technology is routinely available for this, and when correctly applied, the view of many people is that anaerobic digestion plants don't smell. In truth, they routinely create less odour than the farmyard next door. For any resident who is concerned about a new AD plant planning application being approved, due to their concerns about smells, we would suggest that they conduct some fairly simple research. Find out where there are already biogas plants in your area, and make a visit. Go, get out of your car for a minute, draw a deep breath, and stand on the public roadside, and draw in the air, and smell for yourself. In my area there are already 4 anaerobic digestion plants within a mile and a half, of where I live and they are all two or more years old, but I have never smelled them outside of the property where each is located. When I have been detected a suspicious odour I have found that the offending odour was in fact the result of general farming activities and not the AD plant. The anaerobic digestion process has a bad smell, but as long as it is kept sealed in by good practices in the operation of the leachate plant, or other waste disposal method, provided at sanitary landfills, there is no reason for the AD Facility to produce an unpleasant odour. To view the above video on the YouTube website click here. The official Anaerobic Digestion UK figures are out, and confirms that there was an amazing 55% Growth in Anaerobic Digestion Capacity in the UK over the 12 months 2013/14. This massive over 50% growth, is described simply as being "significant growth", by WRAP (the compiler of these figures - See the EAEM Press Release, which is copied in full below). In any other sector this rate of growth would be considered to be huge, and the national press would be full of the achievement. So, why is this latest ASORI report announcement being treated in such a luke-warm manner? We suggest that the reason for this is that the officials are embarrassed to have missed their own target by a large margin, as follows (see the extract from www.ladoma.com below). The achievement of 117 operational biogas sites in the UK at the end of 2014, showed even then, that they were not going to get anywhere near the government's 2011 target of 1,000 operational AD Plants for 2015, and they could not therefore declare it for the success that it undoubtedly has been. To help convey how far the projections fall short of the target, we have included below part of an article by Energy and Environmental Management (EAEM) Magazine. This explains that the current operational AD Plant number has been growing a lot more rapidly since that time, with the pace of plant commissioning accelerating. Currently, there are 400 Anaerobic Digestion plants now in use according to EAEM Magazine. At this rate the magic figure of 1,000 AD Plants in operation in the UK, will finally only be reached some time in 2017. Anaerobic digestion (AD) has grown significantly in the UK, according to the latest sector survey (ASORI), published today by WRAP. employment in the sector has increased by 36% (with 482 full-time equivalent jobs compared to 354 in 2012). In addition, there has been an increase in all the types of feedstocks processed - separated solid food, liquids, manures and crops. However, food and drink waste continues to be the largest proportion of the material processed - with separated solid food accounting for 38% of the feedstocks reported in the survey and liquids 30%. Food manufacturers and processors provide the biggest proportion of the feedstock, however the volume of material sourced from local authority collections, has increased by more than a third**. Over a million tonnes of digestate (the product of AD) was applied to agricultural land in 2013 – that’s 98% of total digestate use – demonstrating the benefits of readily available nutrients as well as potentially reducing the reliance on inorganic fertilisers. Ian Wardle, Head of Organics and Energy at WRAP, said: “It’s fantastic to see such positive results from this survey. The industry is turning a wide variety of wastes into valuable renewable energy and digestate that can be used by farmers as a fertiliser. The report was commissioned by WRAP, working in partnership with the Renewable Energy Association’s Organics Recycling Group (REAORG), Anaerobic Digestion and Bioresources Association (ADBA), and the Environmental Services Association (ESA). It is widely recognised as the most definitive picture of the organics recycling industry. *The Scottish report - A Survey of the Organics Reprocessing Industry in Scotland 2013 - was managed and delivered by WRAP on behalf of the Scottish Government having been initiated in 2013/14. The survey of Scottish AD sites was part of the UK ASORI project, however the Scottish Government also funded a survey of the composting sector. **Of the feedstock for which sources were stated, it increased by around 35% from 170,000t to 230,000t. ASORI – Annual survey of the UK organics recycling industry. A massive 50% rise in Anaerobic digestion plant numbers (and UK capacity in use) to 117, was recorded in 2013 (the latest year for which data is available). But, the achievement has been played down by the UK government. We think that the reason for that is, that a target of 1,000 biogas plants was set for 2015, but even now (mid-2015), only 400 have been commissioned, with the knock-on effect that by the end of 2015 there will still be less than half of those 1,000 plants, operating in the country. The UK/ European biogas industry has been, and still is, growing rapidly and the momentum is growing. We would like to point out that this growth is being achieved, by project promoters, despite uncertainties caused by changes which have been made to the subsidies on offer by the UK government. More reading: BioCycle Magazine has an article about AD Capacity Expansion here.